Ice cream anyone? 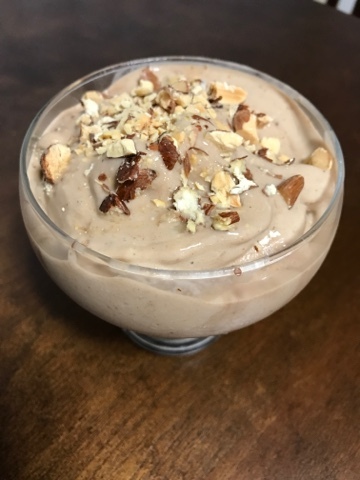 This is the Banana Chocolate Peanut Butter Ice cream I made last night! It's a simple recipe that requires only 4 ingredients & you can whip it up in 5 minutes! Check it out! You can use any flavor yogurt, I used vanilla but I've also made it with banana cream, coconut cream and salted caramel. You can also use vanilla shakeology. 1. Break bananas up and put them in the blender. 4. Blend & stop the blender every few seconds if the mixture gets stuck along the sides. 5. When it's creamy, serve and enjoy it. I topped it with chopped almonds but you can top it with anything you'd like. 6. If you'd like to try Shakeology, contact me for info or a link to the Shakeology sampler where you can try one of each flavor and I can send you recipes and a meal plan with it as well!